Read here about Kenneth Snelson, an inventor of tensegrity and the world's leading sculptor of tensegrity objets d'art. Cover of Kenneth Snelson's free 2013 ebook." link http://www.kennethsnelson.net/"
Kenneth Snelson (1927 - 2016) was a contemporary sculptor and photographer. 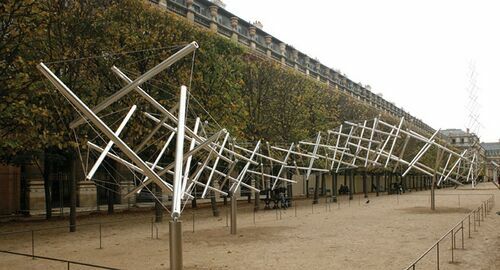 His sculptural works, composed of flexible and rigid components, are arranged according to the idea of tensegrity. He invented tensegrity while studying with Fuller at Black Mountain College. 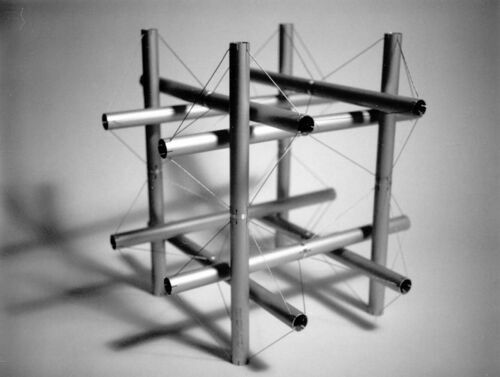 Snelson's work is essential study for any explorer of tensegrity. 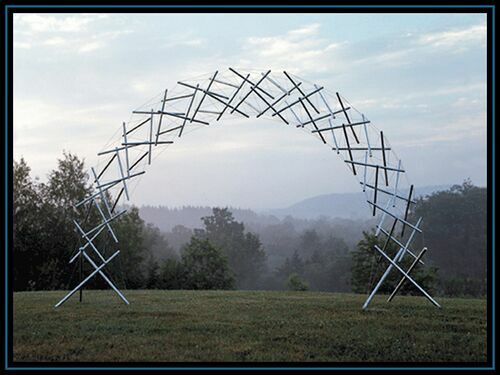 Just viewing his sculptures has been proven to inspire people to new insights into the tensegrity nature of the world. 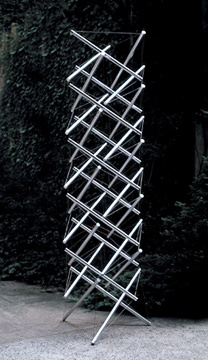 Both Ingber and Levin credit viewing Snelson's Needle Tower to inspiring them in this way. Snelson was born in Pendleton, Oregon in 1927. He studied at the University of Oregon in Eugene, at the Black Mountain College, and with Fernand Léger in Paris. His sculpture and photography have been exhibited at over 25 one-man shows in galleries around the world including the structurally seminal Park Place Gallery in New York in the 60's. Snelson has also done research on the shape of the atom. He lives in New York City with his wife, Katherine. A gallery featuring photographs of some of Kenneth Snelson's work. Equilateral Quivering Tower, 1973-92, by Kenneth Snelson." MoonNight, by Kenneth Snelson, stereoscopic image." 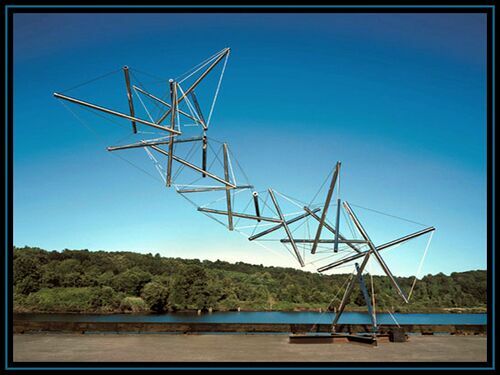 Ninety-Degree Module Experiment , by Kenneth Snelson." 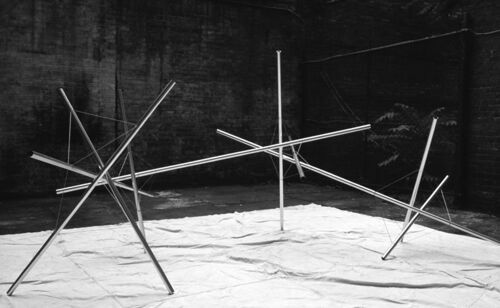 Sprawl Piece 1974, by Kenneth Snelson." 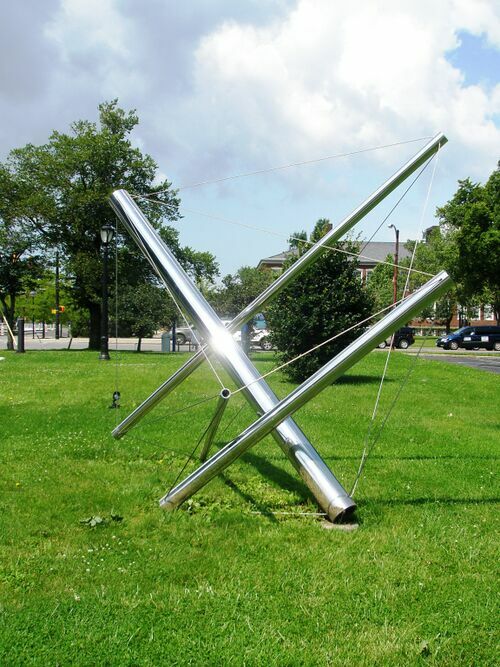 Double Star, by Kenneth Snelson." 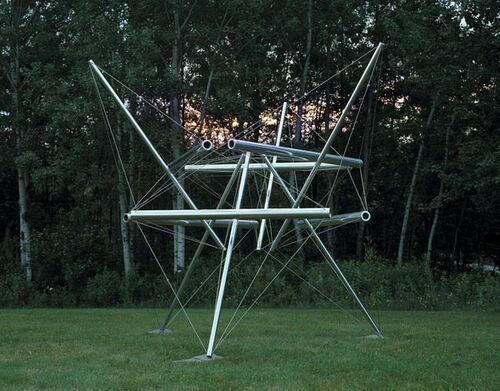 Planar S61, by Kenneth Snelson." 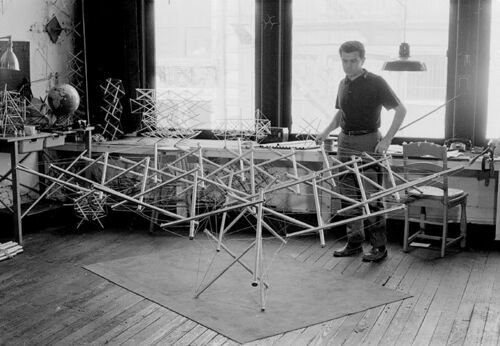 Kenneth Snelson on a tensegrity tower of his making." Sleeping Dragon, by Kenneth Snelson." 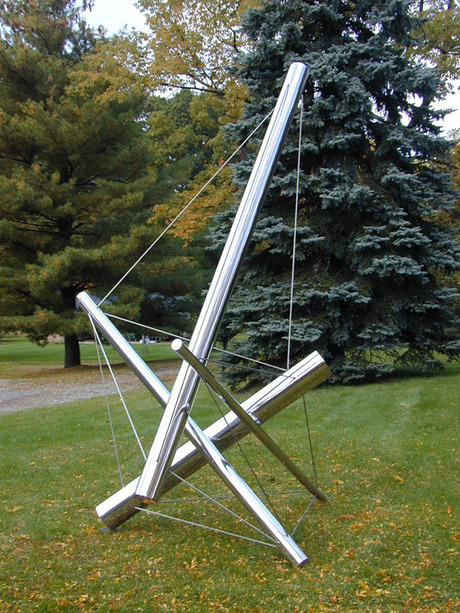 Indexer II, by Kenneth Snelson." 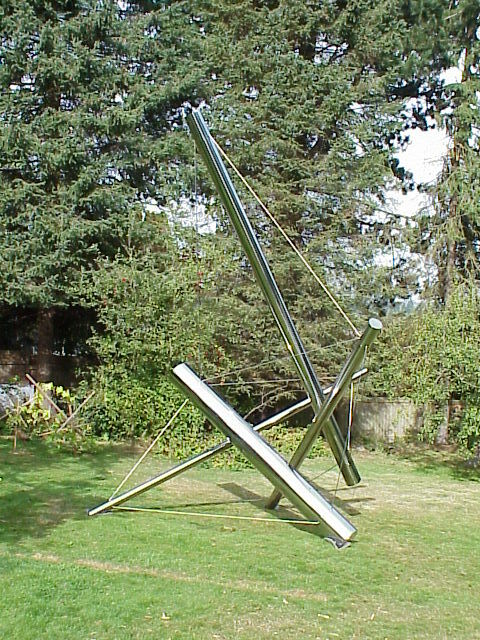 Indexer 2000, by Kenneth Snelson." Rainbow Arch, by Kenneth Snelson." Four Chances, by Kenneth Snelson. (c) hannerola-flickr." B-tree II, by Kenneth Snelson." 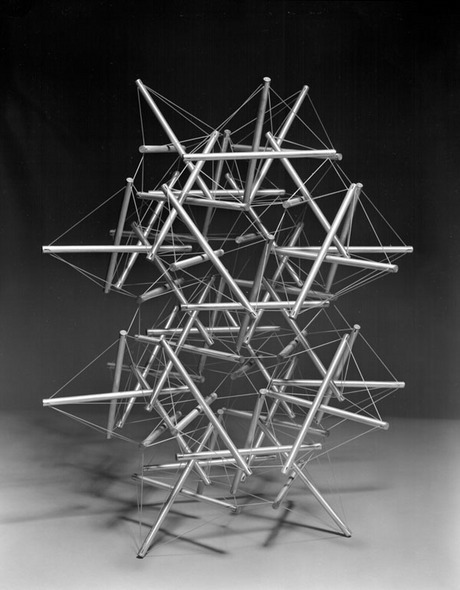 Space Frame Weave, Octa-Form, by Kenneth Snelson." Snelson discovered tensegrity while studying with Fuller. Read here about that discovery, and how Snelson differentiates between his work and Fuller's. Snelson sent a detailed account of his discovery of tensegrity in a letter to Motro, published in November 1990, International Journal of Space Structures R. Motro International Journal of Space Structures. His account was devoted to clarifying his role as opposed to Fuller's. Below is reproduced part of the letter where Snelson describes his discovery process. "As many new ideas do, the 'tensegrity' discovery resulted in a way from play; in this case, play aimed at making mobile sculptures. A second-year art student at the University of Oregon in 1948, I took a summer off to attend a session in North Carolina at Black Mountain College because I had been excited by what I had read about the Bauhaus. The attraction at Black Mountain was the Bauhaus master himself, the painter Josef Albers who had taught at the German school and immigrated to the U.S. in 1933 to join the faculty of that tiny liberal arts college (fifty students that summer) in the Blue Mountains of North Carolina, fifteen miles from Asheville. "Buckminster Fuller, unknown to most of us in those early days, turned up two weeks into the session, a substitute for a professor of architecture who canceled a week before the summer began. Josef Albers asked me to assist the new faculty member in assembling his assortment of geometric models for his evening lecture to the college. There was no such thing as a tensegrity or discontinuous compression structure in his collection, only an early, great circle, version of his geodesic dome. Albers picked me to help because I had shown special ability in his three-dimensional design class. "During his lecture that evening Professor Fuller mesmerized us all with his ranging futurist ideas. As the summer quickly went by with most of the small school monitoring Fuller's classes I began to think I should try something three-dimensional rather than painting. Albers counseled me that I demonstrated talent for sculpture. But, more importantly, I had already become the first in a trail of students from colleges and universities who, over the years, were to become electrified 'Fullerites'. He had that cult-master's kind of charisma. I blush for it now, but it was true. We were young and looking for great issues and he claimed to encompass them all. "At the end of the summer session, I returned home to Pendleton, Oregon. In my Fullerian trance the descent into the real world was greatly confusing. I spent the autumn at home, making my parents miserable by moping and spending hours in the basement, building things; small mobile sculptures mostly, using thread, wire, clay, metal from tin cans, cardboard, etc. I had learned much about geometry from Fuller as well as art and design from the Bauhaus. While Albers' teachings were imparted as useable ideas in public-domain, Bucky's lessons were laden somehow with the sense that the ideas were proprietary -- 'his' geometry. I believed, literally, because he claimed so, that before Buckminster Fuller came along, no human had ever noticed, for example, that to inscribe the diagonals of the square faces of a cube was to define two interlocking tetrahedra within. Students joked that, after all, hadn't Bucky invented the triangle? None of us knew, for example, of Alexander Graham Bell's early space frames, nor anything at all about crystallography. "In the autumn of 1948, as I said, I made numbers of small studies. Were they structures or sculptures? They incorporated the attitudes of both Fuller and Albers. The three small works which are of interest here were concerned both with balance of successive modular elements hinged one-to-another and stacked vertically as seen in photo #1; and, later, suspended one-to-the-next by means of thread-slings as shown in photograph #2. They were, of course, but amplifications of the familiar balancing toys seen often in novelty shops. My small discoveries in these two pieces were logical enough, though one could imagine that they might just as well lead to something other than to the first tensegrity structure; perhaps to variations on Calder mobiles. "It was the effort to make the pieces move which resulted in their spinal-column, modular, property. If I pushed on them lightly or blew on them, they swayed gently in a snake-like fashion. In photo #2 one can see module-to-module sling tension members replacing the wire hinges connecting the modules shown in photo #1. I thought of these threads as adding a note of mystery, causing the connections to be more or less invisible, at least as invisible as marionette strings; an Indian rope trick. "Still confused about my purposes and direction in school, I enrolled for engineering that winter ('48-'49) at Oregon State College. The classes depressed me even further. I hated it and did very poorly. I corresponded with Bucky and I told about my dilemma and also sent photos of the sequence of small sculptures. He must have understood from the letter how confused and depressed I was at school for he suggested I return for another Black Mountain Summer Session. "When we got together again in June I brought with me the plywood X-Piece (#3). When I showed him the sculpture, it was clear from his reaction that he hadn't understood it from the photos I had sent. He was quite struck with it, holding it in his hands, turning it over, studying it for a very long moment. He then asked if I might allow him to keep it. It hadn't been my intention to part with it, but I gave it to him, partly because I felt relieved that he wasn't angry that I had employed geometry (Buckminster Fuller's geometry) in making art. That original small sculpture disappeared from his apartment, so he told me at the end of the summer. "Next day he said he had given a lot of thought to my 'X-column' structure and had determined that the configuration was wrong. Rather than the X-module for compression members, they should be shaped like the central angles of a tetrahedron, that is like spokes radiating from the gravitational center, to the vertices of a tetrahedron. Of course the irony was that I had already used that tetrahedral form in my moving sculpture #2, and rejected it in favor of the kite-like X modules because they permitted growth along all three axes, a true space-filling system, rather than only along a single linear axis. Those were not yet the years when students easily contradicted their elders, let alone their professors. "Next day I went into town and purchased metal telescoping curtain rods in order to build the 'correct' structure for Bucky. I felt a little wistful but not at all suspicious of his motive as he had his picture taken, triumphantly holding the new structure I had built." Snelson generally avoids the term tensegrity since it was coined by Fuller who then used it both to promote his own projects and conflated the term with all of his cosmic and operational philosophy. Snelson used different terms over time including "floating compression" and "endoskeletal prestressed structures"  and sees his work as firmly in an artistic tradition, with little value for practical construction or engineering. Snelson released a free ebook describing his work. Tensegrity Sculpture Self Assemble Kenneth Snelson: A video by Kenneth Snelson. Kenneth Snelson 1989 Interview, where he speaks about his work. Installation of Kenneth Snelson's "Needle Tower": a video of raising the scultpure, following routine maintenance. 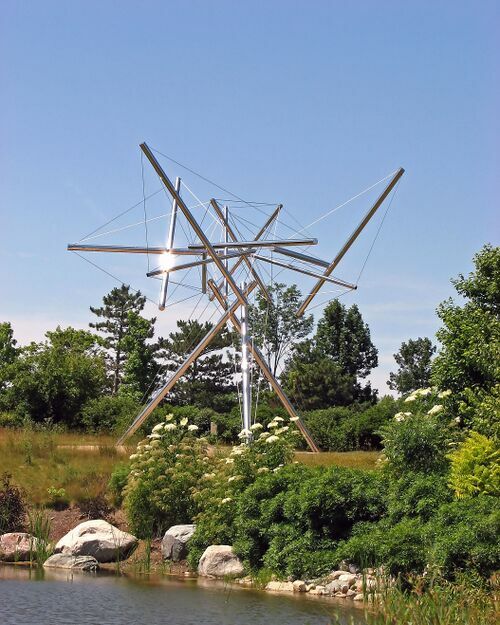 Tensegrity Snelson In Kansas City: Kenneth Snelson speaks about his work. 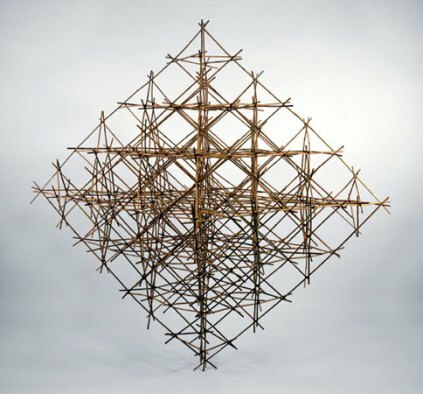 Tensegrity Snelson Osaka Pt 1: Kenneth Snelson speaks about his work. Graphene 2 - Kenneth Snelson: A video by Kenneth Snelson. The book "Forces Made Visible" by Eleanor Heartney includes a DVD with documentaro clips from sculture installations and interview with Snelson from 1989, 1991 and 1992. See Forces Made Visible on Amazon. A partial lists of articles on Snelson and his work. This page was last edited on 18 January 2019, at 09:40.